ChildChild age: 3-10 years. Under 3 ride free. Vouchers NOT ACCEPTED during these blackout dates. Memorial Day Weekend (May 25-27, 2019) & July 4th. Ascend 2 1/2 miles to Mt. 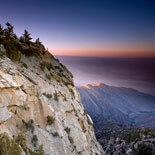 San Jacinto State Park, a pristine wilderness of 14,000 acres, aboard the World's largest rotating tramcars, the Palm Springs Aerial Tramway. The construction of the tram has been labeled the "eighth wonder of the world.'' What a View! 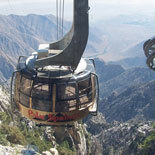 The Tramway covers 2 1/2 miles and boasts the World's largest rotating Tramcars. 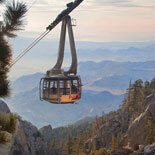 The temperature differential between the valley floor and the top of the Tram is usually about 30 degrees. At the top of the Tram is Mt. 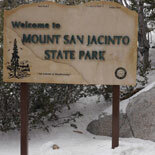 San Jacinto State Park, a pristine wilderness of 14,000 acres. Construction of the Tramway was an engineering challenge and was soon labeled the "eighth wonder of the world.'' The superlative was earned because of the ingenious use of helicopters in erecting four of the five supporting towers. Some 20 years later, the Tramway was designated an historical civil engineering landmark. Mt. San Jacinto State Park offers 54 miles of hiking trails located within a 14,000 acre pristine wilderness, one of the last in California. All trails are accessed by exiting the Tram's Mountain Station and descending a concrete pathway approximately .3 miles to Long Valley. In Long Valley there are picnic tables, water, Ranger Station, flush toilets and some easy trails. 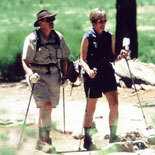 The Adventure Center has available cross-country ski and snowshoe equipment for rent. The Center is seasonal, please check season dates. Our guided nature walks which are available in the summer months are a wonderful way to learn about the natural environment at the Top of the Tram. There is no charge for this one-of-a kind experience. People of all ages can enjoy fun in the snow, and only a few inches of snow are necessary. Sleds and cold weather apparel are available for purchase in the Mountain Gift shop. Spectacular views combined with delectable food provide the perfect dining experience. There are two dining options at the top of the Palm Springs Aerial Tramway: Peaks - a fine dining experience with a breathtaking view of the Coachella Valley. and Pines - a casual caf. Both restaurants are open for lunch and dinner. The Lookout Lounge is a full cocktail bar offering a variety of alcoholic beverages and appetizers and is located on the same level as the restaurants. 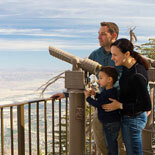 Come and enjoy the breathtaking view riding the Palm Springs Aerial Tramway. It will be one that will be hard to forget! 8:00 am Saturday, Sunday and Holidays. Last car up: 8:00 pm - Last car down at 9:45 pm. Reservation dates can be changed by contacting Trusted Tours at 800-844-7601. Child Ticket: 3 - 10 yrs old. Children under 3 are free but require a boarding pass. Your Ticket voucher will be exchanged for a timed ticket upon arrival.